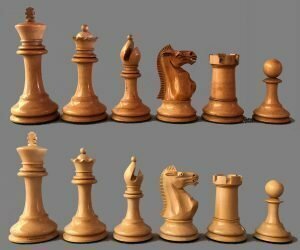 Collector Series House of Staunton Chessmen. 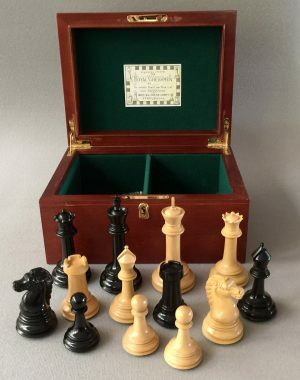 Offered here is a set of Collector Series House of Staunton Chessmen in Boxwood and Ebony, housed in a premium red mahogany hinge-top box. 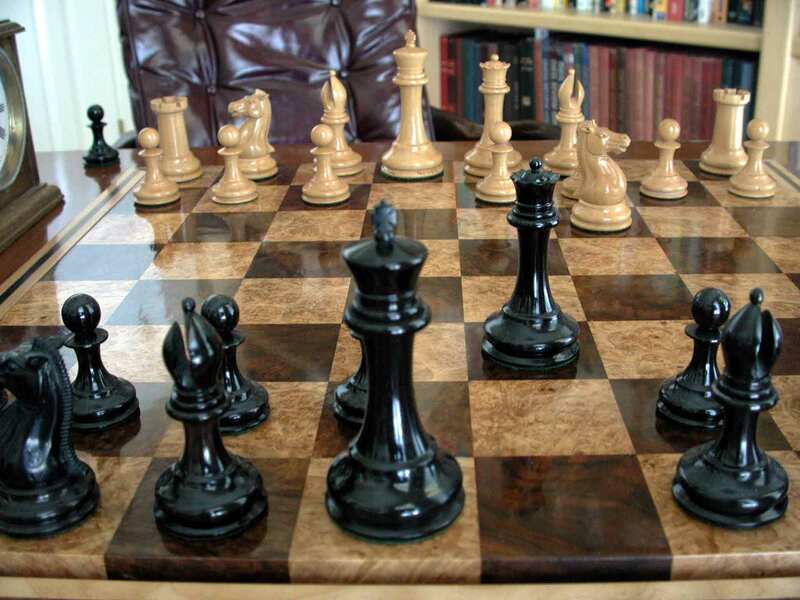 The chessmen are heavily weighted and cushioned with real English baize base pads. The set was designed in 1996 and copyrighted by Frank Camaratta. These sets are produced by and sold exclusively through The House of Staunton. The King stands 4-3/8″ tall with a 2-0″ diameter base. The chessmen play and display best on a chessboard with 2-1/2″ squares. 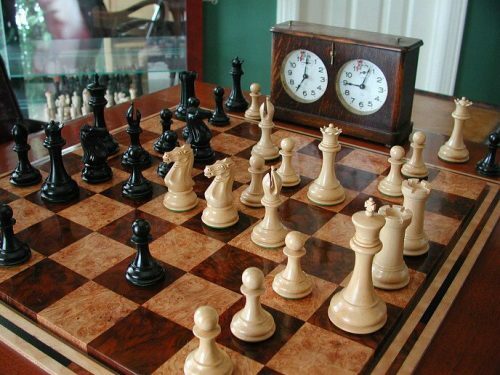 The chessboard and chess timer shown are not included, but suitable chessboards and clocks can be found elsewhere on this site. 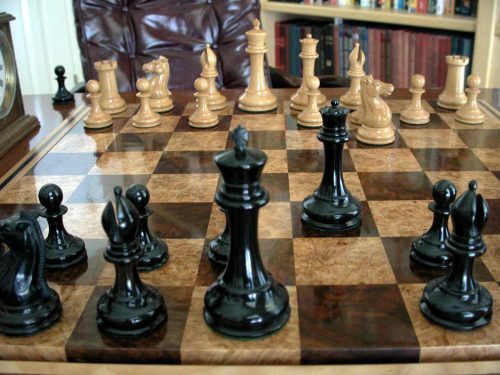 For a large selection of premium chessboards, click here. A selection of new and pre-owned chess timers can be found here. The House of Staunton was founded in 1993 and incorporated in 1999. 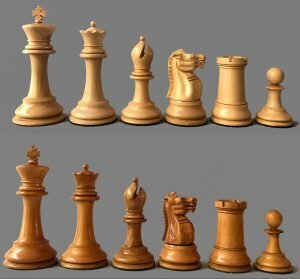 When building the House of Staunton, Frank’s vision was to create chessmen that captured the feel and exquisite old-World craftsmanship found in those early Jaques Staunton pattern chess sets. In line with that pursuit, he needed to recreate the masterful workmanship of the Knights which were derived from the noble steeds whose visages are captured in the Parthenon frieze (expropriated in 1806 by Thomas Bruce, 7th Lord of Elgin and since referred to as the Elgin Marbles). The distinctive, finely detailed Knight head was the hallmark of the original Staunton design. 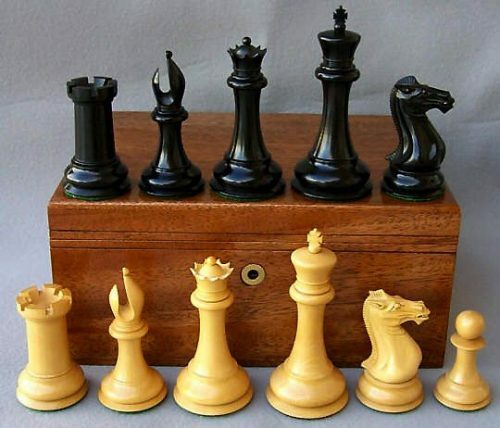 that unique feature is evident in every Exquisite set of House of Staunton chessmen designed by Mr. Camaratta. 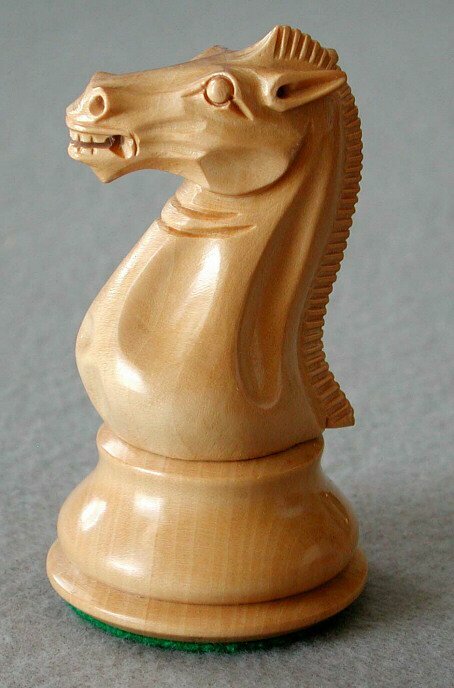 This design is based on the original Staunton chessmen design registered by Nathaniel Cooke in March of 1849 and exclusively manufactured by Jaques of London. 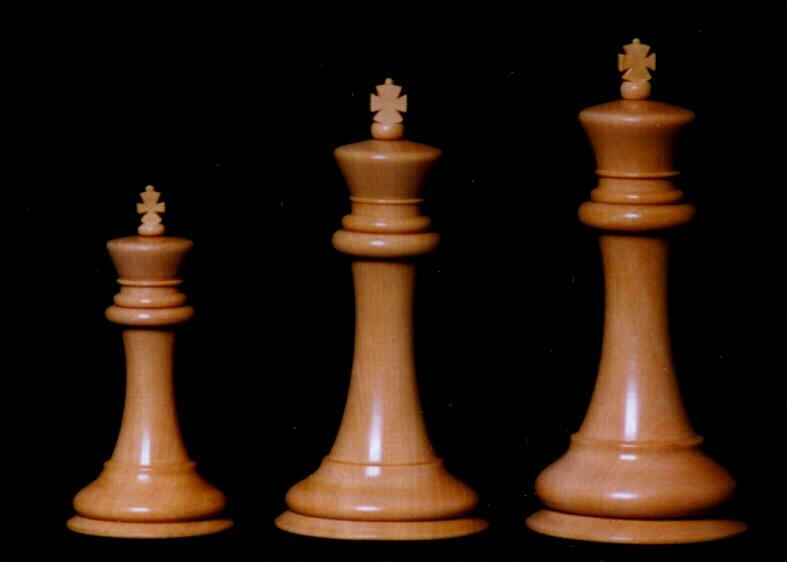 The chessmen were referred to as the Jaques Paulsen Style chessmen made between 1952 and 1854 in the Camaratta Codex.